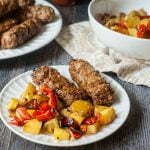 This homemade Italian sausage without casings recipe is easy to make and tastes delicious. Making your own sausage gives you control over what goes in it. These sausages are spicy and bold and great to grill this summer. Cut the pork into chunks and lay on a cookie sheet lined with plastic wrap. Set into the freezer for 1 hour. Meanwhile add all the seasonings to a bowl and mix well. Take the chunks and feed through the grinder. Loosely spread the ground meat on a large cookie sheet and sprinkle the spices evenly over the meat. Use your hands to mix the spices into the meat well. Form the spiced meat into a sausage shape. Get a large saute pan half filled with simmering water and place the sausages into the water. Let cook for only1 minute on each side. Take out of the water and grill until done to your liking.